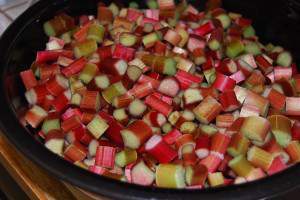 We have been growing our own rhubarb for a few years now. I always have more than I need as I only make a few things with it. 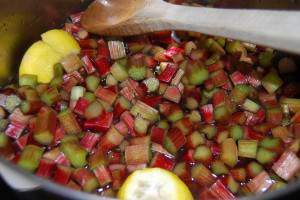 This year I saw a recipe for rhubarb jam over at Grow It Cook It Can It. It looked to be a really easy straightforward recipe. I did change it just a little and the results were better than I expected. I like rhubarb but I am not crazy about it. This jam has changed my mind. This recipe is a two-day process but none of the steps are very hard or too time-consuming. Remove leaves from rhubarb stalks and discard the leaves. Wash the stalks and slice into small pieces about 1/2 inch wide. Put into a large non-reactive bowl like a plastic or glass bowl. Add in the lemon cut in half (I removed the seeds) with both ends removed. Combine with sugar and cover. Place in the refrigerator for a day or two. Getting ready to process the jam. This jam is processed in a boiling water canner so you need to get it started. 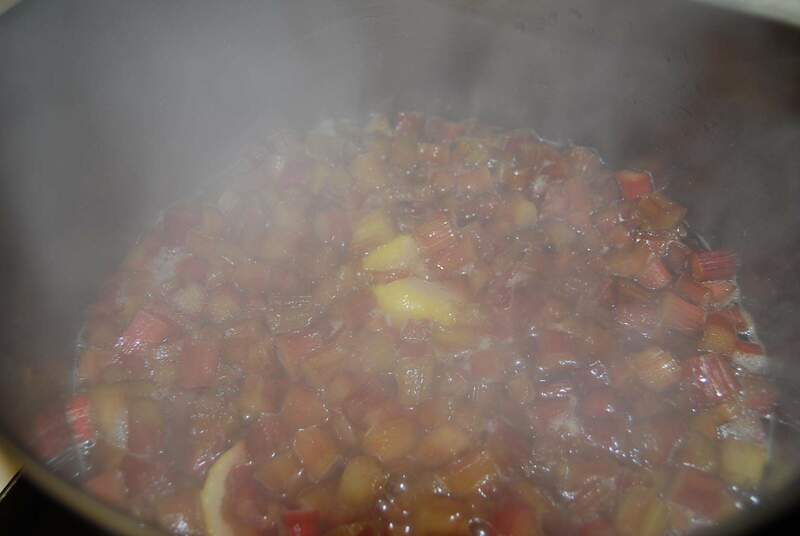 Put the rhubarb mixture into heavy bottom pot. Cook on high heat, stirring occasionally. Try to be careful when stirring not to break up the rhubarb. 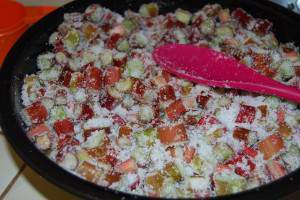 The rhubarb mixture will become thick and gel. To test the thickness. I place a plate in the freezer and put a small amount of jam on the plate that has been chilled. I then return it to the freezer for a minute or two. I take the plate out and see if it is thick enough. If it is thick enough then it is ready to process if not boil it a few more minutes and re-test. 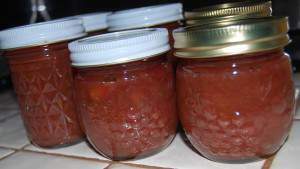 This jam turned out to be a really nice thick jam that we all really like. If you are new to canning you might want to get the Ball Blue Book of Preserving or the Ball Complete Book of Home Preserving. 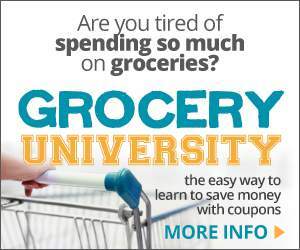 I have the Ball Blue Book of Preserving and it is a great reference for me for all my canning and freezing I do. 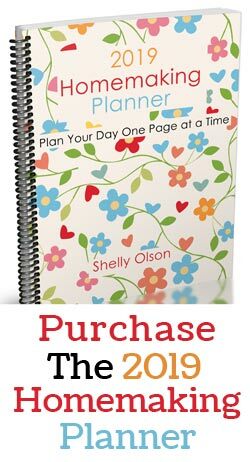 Disclosure: The links for the books in this post are my Amazon referral links. 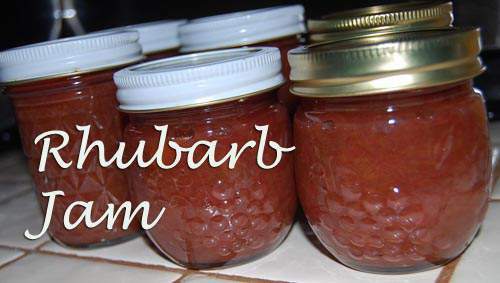 My mom in law who really like rhubarb really loved this jam. I may have to make some for her next year.